pi.pa.po. : We have a winner! :: Wir haben einen Gewinner! We have a winner! :: Wir haben einen Gewinner! First of all, thank you soo much for taking part in the Sew Mama Sew Giveaway Day. Wasn't that just so much fun? I don't know about you but I got nowhere close to visit every lovely blog on the list. I tried to operate systematically but even then, it would have taken me forever to go though all three lists. Here on my little blog I had exactly 200 comments. I read every single one of them and was overwhelmed by your nice words about the bag or the blog. Please understand that I won't be able to answer every comment but all of them were very much appreciated. I hope to see some of you again on my blog from time to time. I think I should better stop talking and start the draw. 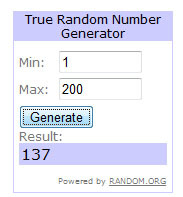 So drumroll please, the lucky winner is no. 137! That is CMEH and she said: "Oh I think this bag is BEAUTIFUL! Thank you for such a generous giveaway!!!" I will send you an email so the little bag will be on its way to Texas as soon as possible! Zunächst einmal vielen Dank fürs mitmachen beim Sew Mama Sew Giveaway Day. War das nicht ein Riesenspaß? Ich weiß nicht, wie es euch ging, aber ich habe es nicht einmal annähernd geschafft, jeden Blog auf der Liste zu besuchen. Ich habe versucht, systematisch vorzugehen, aber selbst dann hätte ich ewig gebraucht, mich durch alle drei Listen zu klicken. Hier auf meinem kleinen blog hatte ich genau 200 Kommentare. Ich habe jeden einzelnen gelesen und bin überwältigt von euern netten Worten über meine Tasche oder den blog. Ihr werdet verstehen, dass ich nicht jeden einzelnen Kommentar beantworten kann, aber ich bin für jeden dankbar. So nun sollte ich wohl mal lieber aufhören zu quatschen und die Verlsung starten. Also Trommelwirbel bitte, der glückliche Gewinner ist Nr. 137! Das ist CMEH und sie sagte: "Oh I think this bag is BEAUTIFUL! Thank you for such a generous giveaway!!!" Ich werde dir eine E-Mail senden so dass die kleine Tasche sich so schnell wie möglich auf ihren Weg nach Texas machen kann. Congratulations to CMEH! It was fun to enter the giveaway, and I enjoyed visiting your blog. Be fair and don't steal. © 2010 by pi.pa.po. All rights reserved. Please do not copy my work for commercial purposes. You may link to this blog but if you want to use any of the photographs please ask first. Sei fair und stiehl nicht. Bitte kopiere meine Arbeit nicht für kommerzielle Zwecke. Du kannst diesen Blog verlinken, aber wenn Du eines der Photos verwenden willst, bitte frag zuerst!